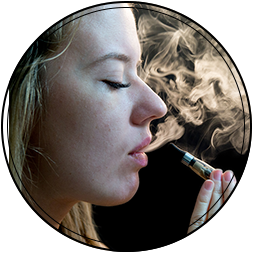 With so many different ways to fire up an E-Cig, vaping can be a very personal experience. Yet, beyond the actual set-up, choosing the right eLiquid is half the battle in finding your vaping sweet spot. In order to make that choice easier, we’ve broken down the key factors to consider when looking to choose the right eLiquid for regular use. However, not all new brands should be avoided. Exciting new eLiquid companies pop up every day that are very reputable and offer exciting new flavors worth your time. Before you buy , research the company and make sure they pass the eye test. Look for a list of their ingredients, check out their social media outlets and see what the vaping community has to say. PG (propylene glycol) and VG (vegetable glycerin) are additives in eLiquids that allow them to produce vapor. Although they both serve similar core purposes, VG and PG ultimately provide users with a much different user experience, respectively. At a glance, eLiquids with higher PG ratios tend to offer lighter, more airy vapor clouds, producing heavier throat hits and less stickiness - making them easier to clean, if leaking occurs. On the other hand, VG-prominent eJuices tend to be richer and thicker in substance, offering bigger vapor clouds and a sweeter taste. Read our full explanation of PG and VG eLiquids here. Whether you’re a traditional cigarette smoker or have never puffed a tobacco cig once in your life, paying attention to nicotine levels in your eLiquids is key to genuinely enjoying your vaping experience. Since nicotine isn’t a required ingredient in vape juices, there’s a fine line between having just enough and way too much, for your personal preference. 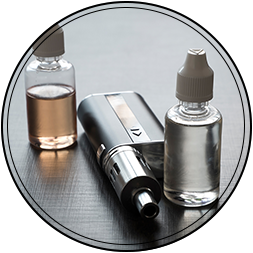 For those who are accustomed to nicotine and prefer the kick provided by the substance, most nicotine-based eLiquids offer the ability to choose the nicotine strength you can include in each bottle - ranging from 0mg to 24mg, depending on bottle size and brand. We always recommend starting at a low nicotine strength such as 3mg before increasing the strength. 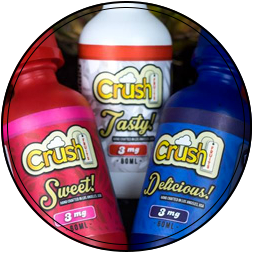 Most brands and flavors offers a 0mg option. 0mg strength eLiquids still produce amazing flavor and a great vaping experience. Most eLiquids are made up of a combination of PG (propylene glycol) and VG (Vegetable Glycerin), accounting for around 90% of the bottle contents. The other 10% is made up of water, nicotine, natural or artificial flavorings. Most of our premium e-Liquids offer a wide variety of flavors and combinations. Can you imagine attempting to choose your favorite food or drink, without actually trying them? Even though you understand how certain flavors go together and might taste, that seems next to impossible, right? E-Liquids are no different. Experimenting is the best way to find your everyday eLiquid and in turn, an ideal vaping experience. With various blends and so many different flavor combinations to consider, users should focus on settling each of the key factors above, then use trial and error to narrow in on their preferred flavor. Trying new eLiquids and expanding your horizons is the key to finding new flavors. Heck, you might even find a few you really like, offering a set of weekly go-to flavors.